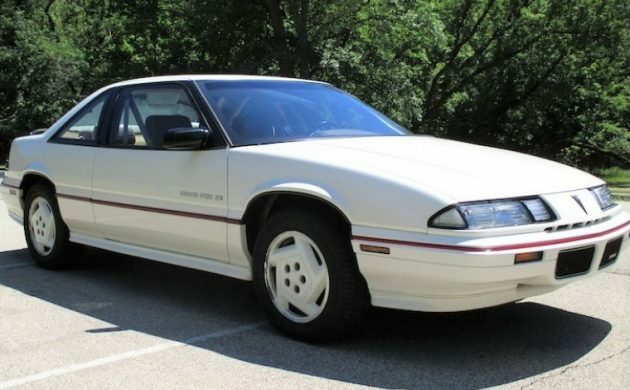 In 1988, it was good-bye to the rear wheel drive Pontiac Grand Prix. Pontiac, along with Chevrolet, Buick, and Oldsmobile moved their two-door coupes to a W platform with front-wheel drive. Each division had a new aerodynamically styled coupe, the Grand Prix with a drag coefficient of .299, one of the world’s most wind-cheating production cars in 1988. These cars looked like they had nothing in common with their predecessors, except for names (even Chevrolet didn’t retain the Monte Carlo, but called its 2 door coupe the Lumina instead). Here is a 1989 Pontiac Grand Prix SE 2 door coupe for sale here on Classics on AutoTrader in Skokie, Illinois. The Grand Prix was available in three coupes in 1989, a base model, LE model (luxury-oriented), and SE (sport-oriented). 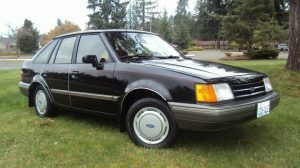 Four-door models would not show up until 1990. The exterior of this SE appears to be in excellent condition. It is painted in white with aluminum color keyed sport wheels. The trunk has a luggage rack atop it. The car has 2¼ inch exhaust with original factory exhaust tips. The Grand Prix SE comes with a Covercraft Custom Premium cover. The interior is quite impressive for this era of car. Included with the SE is a 14-way power articulated driver’s seat. You can adjust lumbar levels, back wing bolstering, individual thigh height, and headrest angle from a center console control pod. 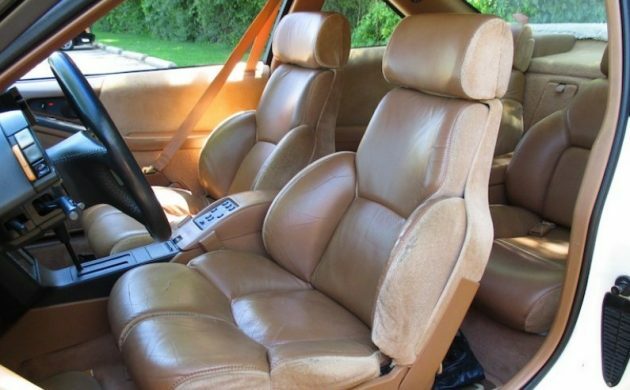 The seats appear to be finished in leather with cloth on the sides. The factory radio was recently refurbished along with a new power antenna motor and mast. The air conditioning has been upgraded to 134A Freon. The interior is smoke-free. Can you imagine being more comfortable in the back seat of a coupe? 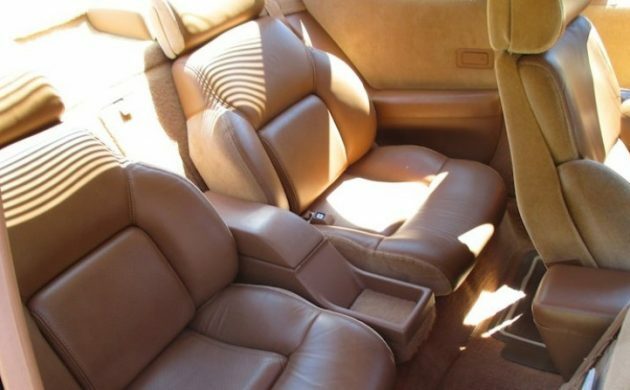 In this Grand Prix SE, you are given bucket seats very similar to the front passengers, even though they don’t recline or have the multiple adjustments of the front seats. You’ll also have a center console for storage items and have a pass-thru to the trunk area. 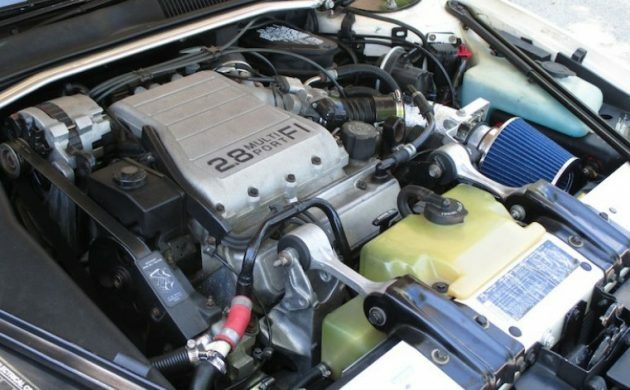 The engine is the original 2.8 liter Multi-Port Fuel Injection 6-cylinder except for a Melling Oil Pump and timing chain set upgrade. The valve covers, intake/exhaust manifold gaskets, oil pan gasket, and front and rear crank seals have been replaced. This car has new engine mounts, a Jacobs Ignition coil pack, and new Delphi injectors and fuel pump. The starter has had a custom rebuild. The TH 440 automatic transmission with 4-speed overdrive has been rebuilt and upgraded. The car has also received brake and suspension upgrades. There are only 69,530 miles since new. The asking price is $7,400. For that price, you will be getting a low mileage car with many mechanical upgrades and maintenance items that have been done. 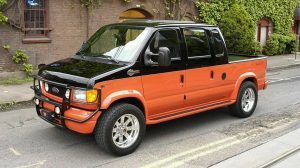 Is this a car you would be interested in? The manual was available through 1993, in the later cars it could be combined with the 210hp Twin Cam 3.4 V6. 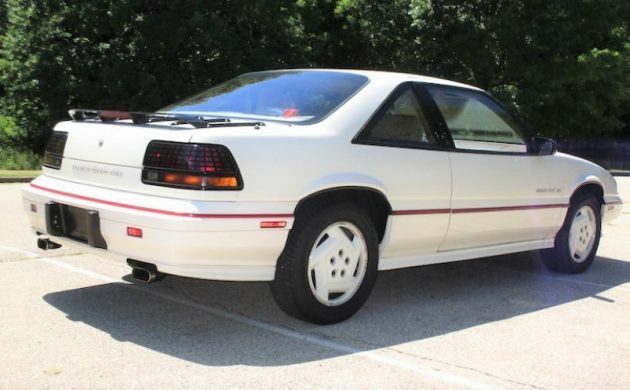 Nice car, I had a 93 GTP auto, really cool interior, though this seems like a bit much, you can find a clean, rarer Turbo GP for about this much if you hunt around. Nice, well-kept, ready to drive example. Not my favorite bodystyle of these now, but like NYC, my younger self sure wanted one. This could be a relatively cheap daily driver that’s a little out of the ordinary today but not so rare that it couldn’t see a little weather. My exact car i had. I loved it and regret getting rid of. I happen to be the original owner of a 1990 Grand Prix SE like this, blue with light grey interior. No luggage rack but sunroof and the 3.1 engine. Will be 30 years old in July. I had a ’96 sedan, the last of this architecture. SE, Teal with the 3.1 V6. That’s about what I paid for it, one year old. Had light bars front and rear, 14 lamps in the rear, 17 in the front. GE bulbs make different colors from Sylvania, etc, and I’m particular, so…. It was an amazing vehicle experience. Fine. Very refined. But at 5 years old, two window motors went out. Not the driver’s, the most used, but the left rear and passenger front. They had been making cars over 90 years and not perfected windows? No GM cars since. I think the 3.1 V6 was available mid year in these, the 88-89 cars have some curious early features like the digital speedo with the analog gauges, the famous radio controls and HUD options didn’t appear until 1990 from what I recall. All the Buick-Olds-Pontiac W cars had the 4 seat option, I think Buick dropped it first around 1990. Pontiacs inherently had a stiffer, more sporting suspension than the cousins, which made them the best of the bunch. Otherwise the same car really. Badge engineering at its peak, which is what eventually brought down the original GM. My 2000 Altima is about 3x the mileage, the ’95 Hardbody is almost 4x. Original engines with original head gaskets still in place and neither of them burns oil yet. Bought both for $2600. Nice car but No. 74k isn’t realistic. Clearly you have no idea at all what the word “badge engineering” means…..please educate yourself and come back. I lived and dealt with it. Lumina, Grand Prix, Le Sabre and 88 were basically the same car. Way to double down on not knowing what the heck you’re talking about….I admire that kind of dedication to being ignorant. What model of Honda Camry GLI do you currently drive? and its it the diesel of rotary? If you meant the Lumina and Grand Prix and the LeSabre and 88 were the same basic car, no. If you meant two examples each from two different platforms then, yes. He meant it the wrong way, you know that. Again if you don’t know what the term “badge engineering” represents, then don’t use it because your read it in a Car and Driver at the dentists office once. How can these cars, the Lumina, Grand Prix, Cutlass and Regal, which didn’t share a single exterior or interior component be “badge engineered”? Coupe posted earlier and the Ford IMO looks way more sleek. Many later car models (the trucks are ridiculous) look like they once had fender skirts at all 4 corners. This car demonstrates how current cars have boring styling and bland interiors. You can’t even buy a Pontiac after 2008. While the 1989 version lacked the classic GP style, it offers the traction of front wheel drive and is easier to park than it’s long hooded ancestors. The V6 is no hot rod but should do fine on this lighter personal luxury car. Great cosmetic condition and updated air conditioning. A great find! ‘Can you imagine being more comfortable in the back seat of a coupe?’ Yes. If the windows actually rolled down. I hated that fixed/popout rear glass trend when it first started in the 70s with the Maverick, Pinto, Vega, Hornet and Gremlin [domestics]. Then opera windows. Now it’s SOP. Love this car though. It’s a beautiful example. Better than the Olds version and I can’t even picture the Buick. More balanced than the ant eater Lumina as well. Never was a fan of body colored wheels, but the seats are nice enough I’d overlook that shade of “corpse” GM passed off as tan during the period. Very nice, clean example that would still make a great commuter car. And I agree with the others, the Pontiac was the best version of the W-platform cars, IMHO. A different crease in the fender, but the same chassis, and who are you to judge me? For your satisfaction, I have a 2000 Altima, 206k, and a 1995 Hardbody, 276k. Both are American made and when they break I put them back together. So please stop with the personal attacks. Eventually the seller will realize this is still a $2,500 car on a good day. Good place to start though! Hey Ralph, not sure why you would get so angry about a guy misstating some facts. So you know more on that subject than he does. Who cares? Chill out, bro, we’re here to enjoy ourselves, and nobody’s perfect. Oh, by the way, it was the Pinto/Bobcat not Pinto/Lynx like you stated. It’s ok though, we know you just misspoke.